What is it? – Puzzle Core is a frantic puzzle-matching game with an interesting twist – you’ll need to manage two screens worth of blocks at the same time. Who made it? – The game was developed by James Strong. How does it play? – Different colored blocks rise from the bottom of the screen, and your goal is to eliminate them by clicking groups of three or more that are adjacent and like-colored. When blocks reach the top of the leftmost screen, they’ll reappear at the bottom of the rightmost screen, where you can continue your block-busting efforts. Block positioning can also be manipulated in the rightmost screen by hovering over a group of two blocks and clicking. 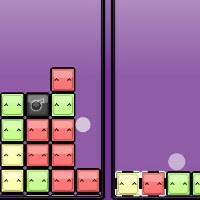 Bomb tiles can also be clicked to eliminate adjacent blocks, regardless of color. As time goes by, more colors of blocks are added, further complicating your progress. The pace at which new blocks appear increases steadily until the stack reaches the top of the rightmost screen. Presentation – The graphics are simple, clean, and colorful. The background color changes occasionally, but other than that, there really aren’t many bells and whistles to distract you from the core gameplay experience. The music frenetic and fitting, but may begin to feel like ear-abuse after a while. Positives – Puzzle Core is a fairly interesting twist on a tried a true formula, and really succeeds in adding an extra level of tension via the dual screen that goes above and beyond many like offerings. The graphics are basic, but pleasant to look at, and it does a reasonably good job of compelling players to try and best their last score. Negatives – Some folks may be disappointed by the pace at which the game’s difficulty accelerates. Around the seventh level or so, things start to get pretty hairy, and even though you may be able to keep the right screen clear until then, the subsequent ramp in difficulty is very steep. The game music did tend to grate on me after a while, and unfortunately, there’s no way to turn it off. Why you should play it – Puzzle Core is entertaining, different, and quite challenging. It’s a great one to try if you consider yourself a puzzle game expert and you may even get hooked for a bit. The pace at which the game speed accelerates might be enough to aggravate, but I still highly recommend checking it out.